Xingcheng City, Huludao of Liaoning Province, won the title of ‘China's Famous Swimsuit City' at the 2010 China (Dalian) International Garment and Textile Fair on September 5, 2010. 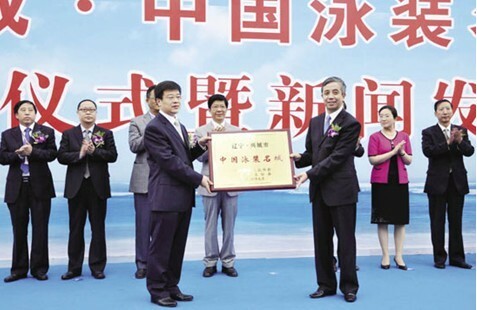 Chen Shujin, deputy director of China Textile Industry Association, confers the signboardChen with the title of "China's Famous Swimsuit City" on Xingcheng City. Xingcheng is the first city in China awarded this title by the China Textile Industry Association and China Garment Association. Chen Shujin, deputy director of China Textile Industry Association, Jiang Hengjie, standing deputy director of China Garment Association, and Shi Wenguang, deputy mayor of the city, were present at the awarding ceremony. Xingcheng's swimsuit industry started in the 1970s. Currently, the city has its own industry chain and sales channels. 71 registered trademarks in swimsuit industry are owned now by the city, and among them over 30 are for export. At present, the city has about 200 swimsuit makers and 30 supplementary materials producers, with 300,000 people engaged in this industry. The annual output stood at nearly 100 million pieces with a total value of about 3 billion yuan, generating about 100 million US dollars in export. Swimsuits from Xingcheng account for 30 percent of the domestic market and 20 percent of the global market. The products are now exported to 25 countries and regions, including the United States, France, Germany, Italy, the Republic of Korea and Russia. Xingcheng enjoys about 70 registered brands, of which, more than 30 are for export. 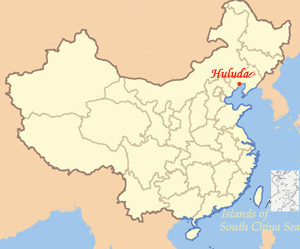 Currently, the local government of Huludao is exerting great efforts to develop the swimsuit industrial zone in Xingcheng. Xingcheng, together with Yiwu, Zhejiang Province, and Jinjiang, Fujian Province, are regarded as the three swimsuit production bases in the country.